Making the Streusel: Preheat oven to 350. Grease a 9 0r 10 inch tube pan. To prepare streusel, in a medium bowl, combine brown sugar, apples, almonds, flour and cinnamon. Stir in melted butter. 1. In a medium bowl, combine flour, baking powder and baking soda; mix well. In a large bowl, using an electric mixer set on medium speed, beat butter and sugar until light and fluffy. Add eggs, one at a time; beat well after each addition. Add vanilla. 2. Set mixer to low; alternately beat flour mixture and orange juice into egg mixture. Spoon half of batter into tube pan. Sprinkle with half of streusel. 3. Spoon the remaining batter over the streusel, spreading to make an even layer. Swirl batter with knife to create a marble pattern. 4. Bake for 15 minutes. 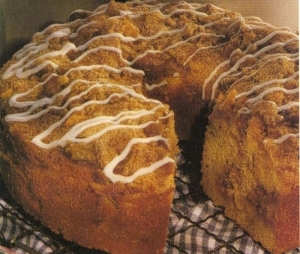 Remove cake from oven; sprinkle top with remaining streusel. Return cake to oven; bake until a toothpick inserted in the center comes out clean, about 3o-35 minutes. Transfer to a wire rack; cool completely. Make the Glaze: Combine confectioners sugar and orange juice. Mix well. Turn cake out onto a serving plate; invert so streusel is on top. Drizzle glaze over cake; serve. Serves 12. Mmmmmmm…with the first day of Fall, comes the desire for a warm apple dessert! Sharon’s recipe really hits the ball out of the park! Enjoy!